If you have been a Boulder Nutrition reader for a while, you probably already know how I feel about breakfast. This summer I published a summertime breakfast blog called Breakfast Bliss and Blood Sugar that became the most read blog in the history of Boulder Nutrition. I am so glad you all liked it! What I am really interested in is WHY? I have a good hypothesis as to WHY for you today, and an even more exciting breakfast menu for you to explore this fall. Listen, I would be surprised if your mornings are totally serene, peaceful, and quiet. I know some of you are the exception and have your morning routine down, but if you are like most of us, mornings can be hectic, scattered, and rushed .I have focused my attention on my morning routine for years. As I have shared before, the mornings when I am on my game I am good at giving myself at least 30 minutes to rise and shine before my kids, to have some time to meditate, practice, and nourish myself well. I have found mindful mornings tend to make ALL the difference. The truth is, sometimes it just doesn't go that way. Did you forget you were out of milk? Push the alarm one extra time? Have a teenager whose hair just wasn't working out? Or forget about that extra stop you have to make for gas on the way to work or school? All it takes is something small to throw our mornings into a tail spin. These reasons (plus many more) might be why breakfast is the most challenging, rushed and stressful meal of the day. So with the idea of giving you more of what you seem to really like reading, here are my 5 favorite FALL COZY breakfasts to settle into this fall. Each of these breakfasts have a little flavor of the weather changing, fall seasonal energetics, and of course you can trust me to keep the glycemic index LOW and your blood sugar BALANCE and BLISS in mind. Health Nugget: What I love most about quinoa (pronounced KEEN WOA) is that it is a complete protein and the highest protein content of any grain. It is also known to dry up dampness in the body according to TCM (Traditional Chinese Medicine). What does that mean? Well, dampness is like a code word for inflammation or phlegm. The less we have of this during the fall season - the season with the most coughs and colds - the better. Health Nugget: Smoothies are one of my favorite ways to pack your breakfast of all the food groups and super foods you want to add to your breakfast. Smoothies are also easy to transport to your office. My favorite feature in this smoothie is that it is not frozen but rather warming as the weather changes those brisker fall mornings. 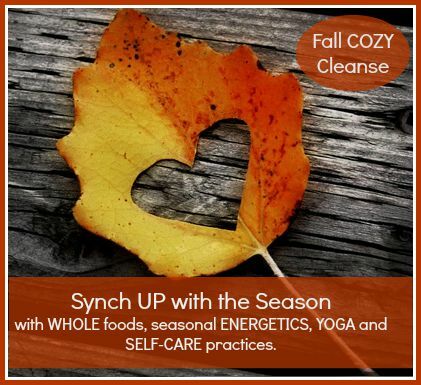 The warm chai tea and warming spices are perfect to synch up with the fall season. Place ingredients in the blender and mix well. Health Nugget: These high protein muffins, disguised as a carb, are a quick and easy breakfast for on the go mornings. Spread with some organic butter or almond butter for another boost in good protein and fat and you will notice that your energy is even keeled all day. Pack all of that nutrient dense zucchini in there and get an extra couple servings of veggies. Prepare them ahead of time, freeze if you like, and enjoy. Mix ingredients and bake at 375 for about 45 min or until golden brown. Health Nugget: These pancakes are a great way to get a sweet breakfast without sacrificing your blood sugar in the process. Adding in the scoop of protein powder is a trick I have been using with my kids for years to ensure pancake breakfasts still include a healthy dose of protein. Along with the yummy seasonal pumpkin, a great source of vitamin A and beta carotene, full of fiber, and potent antioxidants, these make for a great fall breakfast. Mix together ingredients and fry up in your ideal pancake size in a cast iron pan until golden brown. Top with organic butter and maple syrup. Health Nugget: Organic eggs are chock full of the amino acid, tryptophan, which is a key player in a good mood and inner calm. The protein in eggs is one that will not only satiate your blood sugar due to its delicate balance of protein and fat, but will also keep you feeling brighter and cheerier all day long. Saute the tomato and basil in a pan in butter or olive oil. Stir in the eggs to scramble. Toss in raw mozzarella at the end until it begins to melt slightly. Serve up. Want to take your FALL practices a little deeper? If you want to join our group, we start October 12th (introduction October 11th). If you are ready to begin, you can start anytime you are ready.